CEI-IUL organizes another session of the Seminar of International Studies, this time with Dr. Francoise N. Hamlin (Brown University). The title of her presentation will be ‘Rethinking the Civil Rights Movement: History and Remembering‘. The Seminar will take place on February 14, 2017, at 6 p.m., at Auditório Caiano Pereira (ISCTE-IUL). Entrance is free. Françoise Hamlin is an Associate Professor of History and Africana Studies at Brown University. She earned her doctorate in African American Studies and American Studies at Yale University; her Masters from the University of London and her B.A. from the University of Essex (both in United States Studies). Hamlin is the author of Crossroads at Clarksdale: The Black Freedom Struggle in the Mississippi Delta after World War II (University of North Carolina Press, 2012), winner of the 2012 Berkshire Conference of Women Historians Book Prize and the 2013 Lillian Smith Book Award. These Truly Are The Brave: An Anthology ofAfrican American Writings on Citizenship and War is a co-edited anthology published by the University of Florida Press in 2015. It was a finalist for the QBR 2016 Wheatley Book Award in Nonfiction. Hamlin’s new research focuses on young people, trauma, and activism. Her most notable fellowships and awards include: the C. Vann Woodward Dissertation Prize; the Du Bois-Mandela-Rodney Fellowship at the University of Michigan; the Charles Warren Center Fellowship at Harvard University; the Career Enhancement Fellowship for Junior Faculty through the Woodrow Wilson National Fellowship Foundation; and the Fellowship for Recently Tenured Scholars from the American Council of Learned Societies. 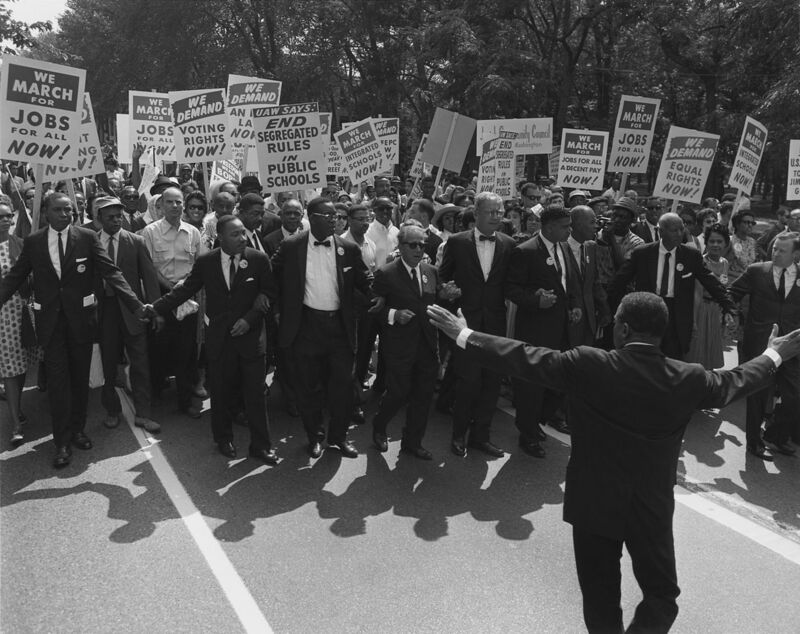 How do we define the mass movement for civil rights in the U.S.? What and who gets included and what is left out? How can the past inform our present? This lecture begins a conversation about the importance of history. Understanding how we periodize and define social movements shapes historical memory and the utilisation of that memory in contemporary society. Given how African American history in the twentieth century pivots around this mass movement for civil rights, analysing the scope, nuance, and multiplicity of social activism and its limits offers an opportunity to discuss race, gender, memory, and history-making. In addition, some of the political, social, and cultural ramifications of mainstream framing of the mass movement becomes clearer. 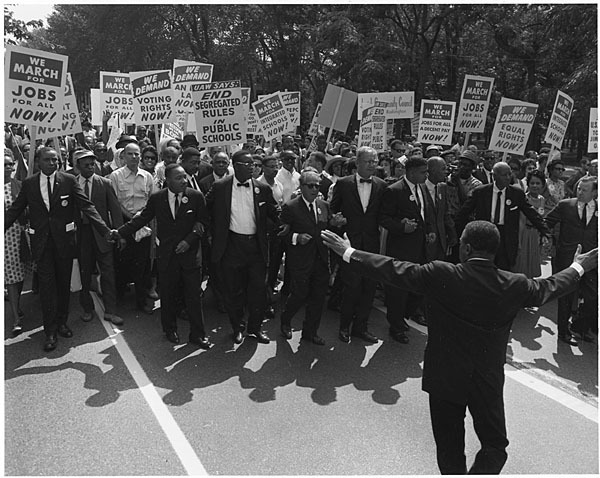 Martin Luther King Jr., Joseph L. Rauh Jr., Whitney Young, Roy Wilkins, A. Philip Randolph, and Walter Reuther at the March on Washington, August 28, 1963. Photo by United States Information Agency / Public domain.